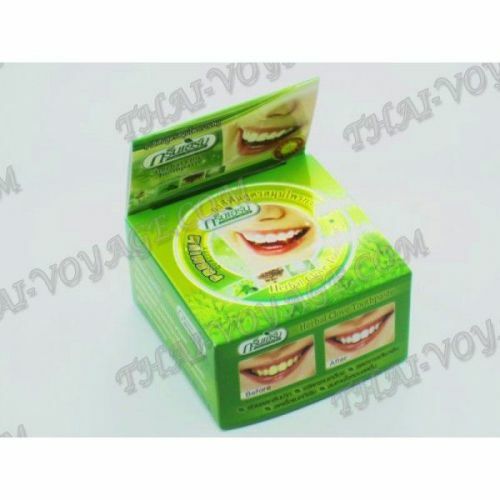 Modern whitening toothpaste Green Herb premium created based on extracts of various herbs and essential oils. Has an excellent whitening effect. Removes plaque and Tartar, removes dark plaque on the teeth from coffee, tea and tobacco. Freshens the mouth. Breathing becomes fresh. Prevents the growth of bacteria in the mouth, has excellent antiseptic properties. Prevents tooth decay and periodontal disease, reduces tooth sensitivity. Tones and strengthens the gums, prevents bleeding. Does not erase the tooth enamel does not contain abrasive, dyes and flavorings. The whitening effect is noticeable after a few days of use! Toothpaste Green Herb and smells good and very economical, one jar lasts for 3 months of use by one person. Application: to put on the toothbrush amount of toothpaste the size of a small pea, after applying a jar tightly closed. To brush at least 3 minutes. Rinse the mouth thoroughly with water. It is recommended to use 2 times a day, morning and evening.